My mother once ran a dairy in Taylor Street, Blockhouse Bay (called the "Bounty Dairy") in the early 1960s. She told me of a day when she apparently ran out of milk before 3pm (the deliveries happened after 4 o'clock) and a customer, irate that when she popped in to buy a pint between 3 and 4 she found Mum had sold out, went off and complained to some authority -- perhaps Auckland City Council -- that Mum had breached her milk selling licence. I don't think Mum was fined or anything. Just told, in no uncertain terms, that to run out of milk before 4pm was something One Did Not Do. I grew up in the mid to late 1960s to 1970s. To me, it seemed that you always just went along to the local corner dairy, or put out tokens for the neighbourhood mobile milk vendor, and picked up a bottle of moo that way. It never entered my head that milk distributrion and supply would be so strictly regulated, and so Mum's story always sounded surreal. One thing about local history study: the longer you stick at it, and the more you read and listen, things that seemed surreal to the contemporary mind soon become "ah ha!" moments. Yes, indeed, milk was regulated, from cow's teat through to the corner dairy counter, here in Auckland. From 1934, actually, when the first Auckland Metropolitan Milk Act came into effect. The appointment of the milk council provided for in the Auckland Metropolitan Milk Act is expected to proceed shortly. Advice is awaited from the Minister of Industries and Commerce (the Hon. J. G. Cobbe), who is required to confer with the interests to be represented on the council, and then to make recommendations to the Governor-General, who will make the appointments, says the "Herald." The legislation provides for the establishment of a council to organise and control the distribution and sale of milk in the metropolitan district. Although the members of the first council will be appointed, elections will be held to select subsequent members. Those elections will be held every two years, in February, the first one taking place in February, 1935. On and after a date to be fixed by the council it will not be lawful for any person or corporation to sell milk in the district, to deliver milk in the district, to bring into the district for use, consumption, or sale milk purchased outside the district, or to be in possession of milk for sale in the district, except under licence issued by the council. Alec Brown's book Town Milk: A History of Auckland's Town Milk Supply (1992) gives a detailed account of the history of the major suppliers, along with the history of regulation and legislation around the supply of milk. Very briefly, the regulations were revised, amended, adjusted in an almost dizzying series of moves from 1934. The basic aim was to ensure a steady supply of milk to the consumers in the region. In November 1936, in the days of milk straight from the can by dipper off the back of the milk cart, zoning for vendors was introduced on the North Shore, Avondale and Blockhouse Bay. The result on day one on the North Shore must have been a bit of free entertainment for those witnessing what happened. All was not so quiet in the milk zone on the North Shore this morning. The first trial of the new zoning system of milk delivery, initiated by the Auckland Milk Council, was being made, and for a while everything went swimmingly. Then a horse bolted -- and in one area at least drama broke the routine. That was in Ewan Street, Jutland Road, Hauraki Road, Lake Road area of Takapuna. Here two horse floats were in operation on the delivery. Suddenly one of the horses, working Lake Road, took fright, raised its head and its hoofs, and was off. Down Lake Road it tore, the float swaying and jolting behind it, and the driver in late, but hot, pursuit. Rounding the corner into Hauraki Road, the pace was at its hottest, and the horse was still heading the field. But a ten-gallon can here broke its moorings, and in a clatter of can on the road the milky flood spread in a cumulating flow to the gutter. A motor car had joined in the race, and with skill the driver, in the outside position, was endeavouring to cut across the horse's path. The horse swerved, and in a moment another can had emptied its contents. A case of bottled milk was sliding towards the tailboard and was threatening to join the rout when at last a pursuer caught up, mounted the float, and brought the quivering horse to a stop. Here was trouble for the delivery man. Already running late, owing to the didfficulties of taking over a new round of customers, the delivery was further delayed, and in some houses the morning's milk did not come home until 8.30 or nearer nine o'clock. Many householders were caught unprepared, and colour was added to the drama by the number of pyjama-clad men and dressing-gowned women who made their way, jug or billy in hand, to the nearest dairy in search of a cow or its product. There was one household, at least, where trouble had been expected, and its pessimism was rewarded when the tinned milk was produced amid general "I told you so!" congratulations. A dairy in that vicinity sold out, and unavailing pleas were made by the shopkeeper to a passing milk lorry driver for further supplies. Apart from the incidents in that territory, it is stated that everything proceeded satisfactorily. Though in most cases the milk arrived at the usual time, there were cases of delay owing to the difficulties experienced by roundsmen in covering new rounds, without first-hand knowledge of where each particular container was kept, or which was the right entrance to houses. A number of residents in Devonport and Takapuna expressed themselves as satisfied -- though there were a number of protests, too, at the introduction of the new system. Two inspectors from the milk council watched proceedings, and they said afterwards that everything went as well as was expected for the first day. The milk vendor and the corner dairy reigned supreme in New Zealand until deregulation in the 1980s -- in fact, supermarkets were specifically forbidden to sell milk, and compete with the vendors, until 1986. Price controls came off in 1993, but by then only a third of customers still used the milk vendors for their daily supply. Over the next few years, the milk carts (by then motor trucks, of course, many with distinctive horn sounds to summon the customers to their letterboxes each night) faded into our history. "(by then motor trucks, of course, many with distinctive horn sounds to summon the customers to their letterboxes each night)"
Did milk delivery times change to the other end of the day? They must have, Jayne. I only remember them coming around from 4pm each night. Here from Andrew Highriser in Melbourne. The term 'dairy' is interesting. You refer to a corner store type venture, yes? Did they sell other than milk? I must ask my father if his shop in Hornsby sold milk and in what form. My grandmother kept the shop from 1932 until 1956. Dairies as corner convenience stores came about as the retail outlets of early dairy product companies, such as Amburys. Once, you'd go to a dairy to purchase some milk in the older days, and that meant a milking shed plus cow. When the companies started organised distribution from about the 1890s, the concept migrated to be descriptive of anywhere dairy products were sold. I find it's a New Zealand thing (that recent Oxford Dictionary of New Zealandisms has an entry for it). I never realised it was just us, until I got on the Internet years ago, chatted with Aussies, and got the "What's that?" reaction. Dairies, as I said, are convenience stores. Some evolved into small grocery stores. Today from them you can buy groceries, dairy products, soft drinks (sometimes alcohol), cigarettes, newspapers, etc. The word dairy, though, seems to be under the attack of the international cultural forces, especially from America. It will be sad to see the word completely vanish in that context. I agree with you. I find the terminology quite charming, without in any way trying to put it down. It is like supporting the word 'cinema' rather than 'movies'. I am always very careful to say that I am going to see a film at the cinema, rather than a movie at the movies. I have no idea how and when our milk changed its mode of distribution. Must rectify that. Hi Julie. We could always revert back to the old Americanism, just for a giggle and to see reactions, by saying we're "off to the flicks." Which reminds me of when I recently wandered around a shop selling curios and nostalgia pieces. They had a bottle there, similar to the genie's bottle seen in the "I Dream of Jeannie" telly series, and labelled it as such. I asked them how many times they had customers (aged 30 and below, I'd say) asking who Jeannie was? They said, "Quite a few ..."
My father was a milkman in the late 60s to mid 70s. Deliveries originally started at mid-night and then changed about 1972 to 5pm delivery. I am trying to find out the date of the change as him and I got our photos on the front page of the Herald, obviously big news for the day. I have fond memories of pounding the streets of Remuera and enjoyed the mid-night deliveries the most. Great rugby training!! And then each day it was the hours of counting all the 2cent coins (4c a pint) and tokens. Thanks very much for your comment! 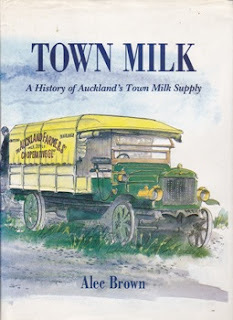 Just looking at what's to hand which might help re the change in time -- there was a thesis done at Auckland University you might try: "The Auckland Town Milk Supply Area: Aspects of Change on the Rural Urban Fringe, 1962-72," by Daniel Martin Searle (1973. Also at Auckland Council Archives, they have a file on the "Auckland Milk Treatment Corporation - New Zealand Milk Board" (1961-1973), ACC 275 61-182, ID 455136, which might help seeing as it is in that period. my grandad delivered milk in the Devonport area around the 50/60's im guessing as he retired in about 1973 - there was an article in the herald when he did retire - I have loads of old milk bottles that I have found under his house and in his shed.